1987, Starring Lazar Rockwood, Bonnie Beck, Gary Freedman, Ben Kerr. Directed by Bozidar D. Benedik. 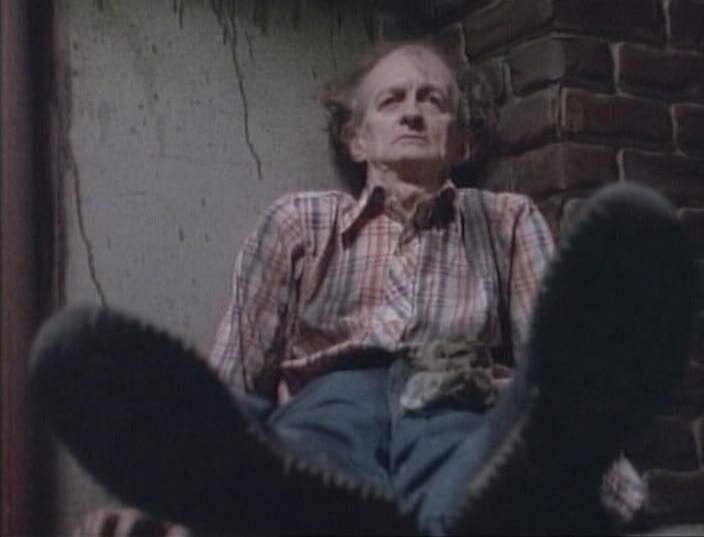 A no-budget obscurity from the dusty bottom row of the VHS shelf, Beyond the Seventh Door is a strangely mesmerizing low budget Canadian thriller that matches high concept plotting with one of the most bizarre performances seen in a professionally mounted production. Bozidar D. Benedikt, the film's memorably named Croatian born writer/director, got his start in filmmaking with a handful of animated shorts in his native Yugoslavia. Nearly 20 years later, after emigrating to Canada, Benedikt had turned almost entirely to writing fiction, penning more than 20 novels, largely for distribution in the former Yugoslavia. But, at the tail end of the tax shelter era, he was lured back behind the camera for three feature-length genre outings as big on ideas as they were short on cash. 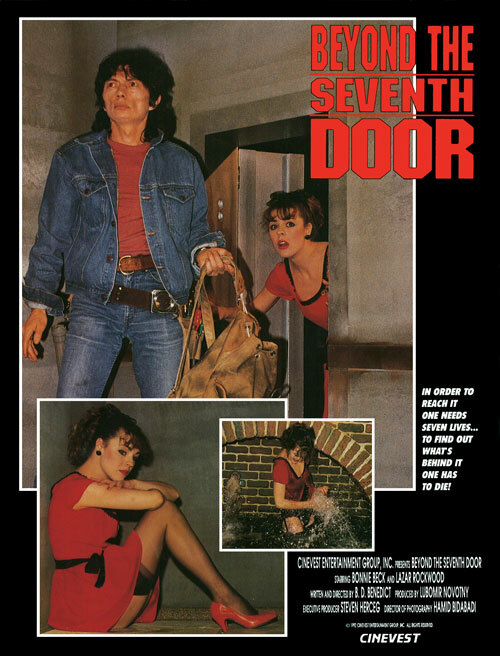 Beyond the Seventh Door was the first of these productions, followed quickly by Brooklyn Nights and Graveyard Story. Ludicrously plotted but oddly satisfying, Beyond the Seventh Door is from a script based on one of Benedikt's (possibly unpublished?) books. Released from jail, ex-con Boris (Lazar Rockwood) is ready to go on the straight and narrow until he meets up with former girlfriend Wanda (Bonnie Beck). Now working as a maid for a prominent paraplegic millionaire (Gary Freedman), she convinces Boris that it would be a cinch to break into her boss' palatial estate and grab some valuables before anyone even realizes. Boris reluctantly agrees, but when the two force their way into an unguarded basement entryway during an elegant costume party a few days later, they find a big surprise--as the door clicks shut behind them, hidden loudspeakers inform the pair that the basement has been converted into an elaborate trap for potential thieves, six chambers of deadly puzzles that, if solved, will lead the pair to the most valuable reward they could imagine. Once this setup is out of the way, the film is little more than Boris and Wendy navigating through each chamber in search of a big payday. Sure, there's a little back and forth about their past relationship as they make progress to their goal, and the two even take time for a quickie after springing one of the death traps--apparently, nothing gets these would-be-criminals hotter than near-death experiences in dirty basements. But largely, the film revolves around solving each trap, as Boris digs around in a curiously well-stocked toolbelt to outsmart his captor. First, they are given 20 seconds to run and slide underneath a closing steel shutter (well, plastic venetian blind), and then must crack the combination on a bank vault door. In the third room, they must step on the correct lettered floor tiles to spell out the answer to a complex riddle. Next, it's figuring their way out of a windowless room before they are impaled by spikes descending from the ceiling, followed by unscrewing a metal plate covering a portal in the wall before a chamber fills with water. Finally, in the sixth room, they discover a booby-trapped suitcase of money and the fabled seventh door, behind which is an elevator that will take them to freedom. But even then, all is not as it seems. While not among the more notable Canadian B-films of the late 1980s--it resembles an Emmeritus TV movie more than anything--Beyond the Seventh Door is still fascinating in its focus on characters using both brains and brawn to solve puzzles as its only real plot, a choice that aligns the film with grander works like Sleuth and The Last of Sheila, only with half the ambition and none of the budget. But even still, Benedikt manages to make the most of what money he did have, restricting the story to just four actors and a handful of locations, including beloved (but now gone) Toronto Annex neighbourhood eatery Dooney's, Castle Loma exteriors and, for the trap-filled basement, a mix of studio settings and cramped Toronto public works passages (and, reportedly, the basement of Yonge St. haunt the Colonial Tavern). There's a palpable claustrophobia to the underground trap sets that really works in the film's favour--the chambers are ugly, uncomfortable and dirty, and the viewer wants to get away from them just as much as the characters. Problem is, when you have such a limited cast, you end up spending a lot of time with those characters, which puts much of the film's success on their shoulders. Bonnie Beck, who made her own career in low-budget Canadian horror before transitioning to regular TV appearances, is OK here, doing the best she can with some stilted dialogue and a complete lack of chemistry with star Rockwood. Freedman, who only appears shot from behind, was the film's script supervisor doing double duty, while iconic Toronto street performer and perennial mayoral candidate Ben Kerr makes a brief but welcome cameo as a corpse in the water chamber who holds a screwdriver that Wendy must use to get away. But really, this is Lazar Rockwood's film, as he appears in almost every frame. 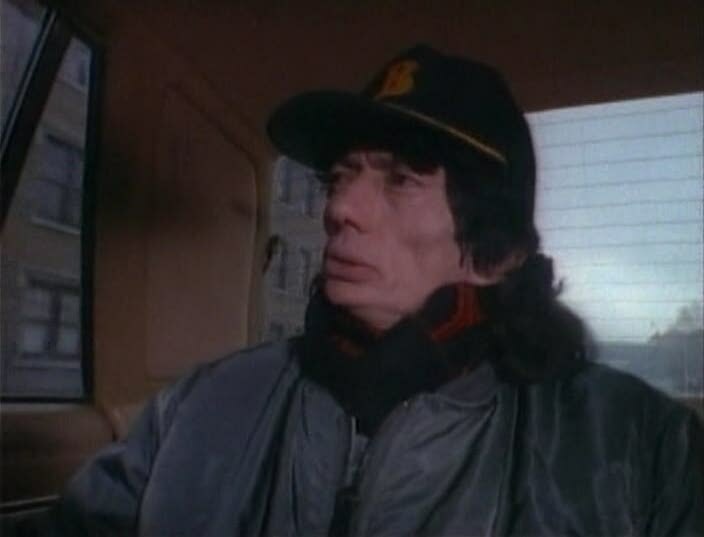 With a weathered, wrinkly face, thick lips and a flowing dark mullet, the Yugoslavian-born actor's odd, creepy performance--his first--is astonishingly uncharismatic. Spouting his lines in a sometimes incomprehensible Eastern European accent and displaying a complete disregard for the craft of acting, Rockwood comes off completely uncomfortable and twitchy on camera, struggling to portray the (few) emotions demanded by the script and making nonsensical improvisations where required. Among his annoying quirks are constantly fiddling with his cigarettes, mispronouncing words and howling "nooo!" every time each chamber door locks behind him, as he seemingly forgets that the door from the previous chamber has been blocked off too. Rockwood is far more suited to character parts than any kind of lead, as his later roles bear out--after starring again in Benedikt's Brooklyn Nights, he somehow graduated to playing bit roles and villains in Jalal Merhi's 1990s action films before landing a recurring role on the Toronto-shot Witchblade TV series. Perhaps due to a desire to break through into foreign markets, Canadian tax shelter filmmakers tended to embrace high concept plotlines, but this may be the most spectacularly silly story of them all. While better-known Canadian B-films like The Tower, Murder By Phone and Rock 'N' Roll Nightmare may provoke laughs from their weird plot twists and implausible ideas, Beyond the Seventh Door is just serious and engaging enough to distract from any such shortcomings, using the sometimes exciting trap escape sequence to keep viewers from nodding off prematurely. Still, fans of those films--as well as anyone curious about Rockwood's unorthodox approach to acting--will surely want to track down this rarity and lose themselves in Benedikt's subterranean lair of cinematic traps.